One of the things that we enjoy about our job is discovering new places,revisiting old favourites and sharing our experience and knowledge with our customers. So going back to Cuenca, that small but majestic medieval cliff hanging city,provided us with a perfect excuse to rediscover the city and try out some new bars,restaurants and explore the back streets. Foreign tourists now jam the main square full; sitting and consuming coffee,beer,tapas etc. It was quite an influx of people compared to three years ago when we last visited but we had expected this as we had heard the new AVE now brings large numbers of international tourists on day trips from Madrid. And sure enough in the evening the atmosphere was more relaxed with less people around. And to be honest in Cuenca,with a little imagination and a quick wander off the main square and street it very easy to find enchanting quiet zones, to get lost in side streets,sit in mini parks overlooking the famous gorge below and generally explore back streets, local shops(“for local people, you know”) and bars. 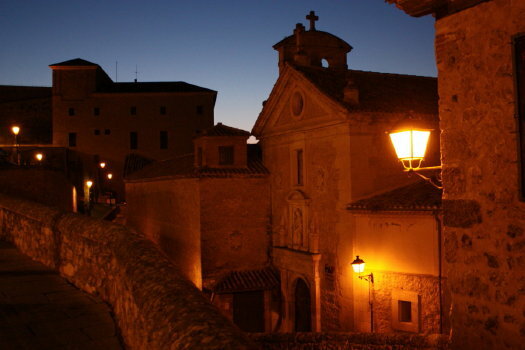 Cuenca is especially interesting at night when darkness brings with it dark shadows which along with narrow streets and medieval buildings huddled together produce an eery and even haunted atmosphere harking back to times of the Spanish Inquisition(they had their regional headquarters in the city in a very large sombre stone building,See photo below). Walking around at night on the very quiet streets gave us the sensation that someone was following us just a corner or poorly lit alley away, stalking us in those dark lanes.For this exact reason Cuenca is used to film period films and series for Spanish TV such as “Aguila Roja”. So a late night walk or early morning stroll are highly recommended to get a bit of atmosphere into the system. -There are owls in the spectacular gorge surrounding Cuenca whose twit tawooing echoes around the gorge adding to that eery feeling at night.I went out for walk in the darkness of early morning:The owls hooting,the dark shadows,and the lack of 21st century noise pollution along with muted lighting made me think, “This could easily be a couple of hundred years ago”. The silence was complete(the old part of the city is set away from the modern part) and only broken by our feathered friends hooting to each other until the dull light of sunrise on the horizon became more pronounced and chased away those lurking shadows and the first local microbus came up the hill and parked right next to where I was contemplating the view.Its driver getting out to have an early morning puff on a cigarette.This mundane 21st century act seemed to be a signal for all owls to go to sleep and maintain silence. -Cuenca has its fair share of urban myths. A Spanish tourist pointed out to us two or three huge rocks not far from San Pedro’s bridge that apparently had fallen off the cliff around eighty years ago and had crushed a gypsy family who are still buried under the rocks as they are so huge no one could move them. I can’t find any info. on this anywhere but it makes for a strange story. 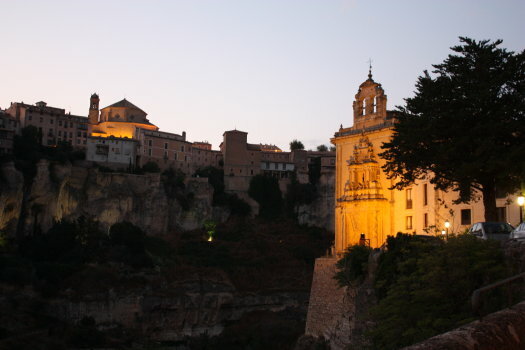 -The old city is the perfect film set – A Japanese company has made an animated cartoon based on Cuenca. Made by filming the different parts of the old city and then transfering it into cartoon format by digital and manual manipulation. And for that reason Cuenca has had an increase of over 500% in Japanese tourism this year. -Lambs intestines on a twig are still after all these years of modern Spanish cuisine the local favourite tapa. -Never walk across the San Pablo suspension bridge on an icy night. I once did years ago and it was a vertigo inducing experience. 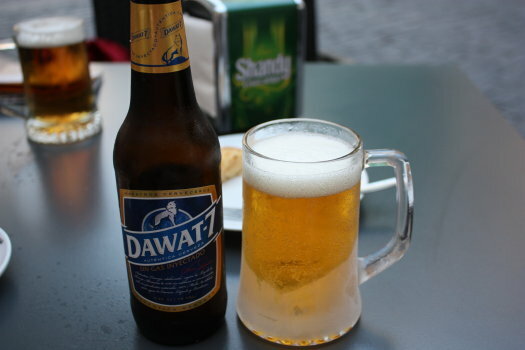 -The local craft beer has a ‘different’ name: Dawat 7. -Prehistoric Conquenses were supposedly the first cavemen on earth to hallucinate on magic mushrooms…(now you know why the intestines on a stick are so popular). -There is a local legend that a local lad,in the middle ages, became enfatuated with a girl who was a stranger to town. After a while he found out,whilst carrying her in out of the rain, that shehad,under her cape,lovely hairy hooved goat’s legs and was the Devil himself. (I know,I know it sounds as if the local lad had probably been at the mushrooms too). -Under the old city are a maze of unexplore/blocked up tunnels most of which have not been opened up for centuries.Legends and rumours of Moorish treasure abound which is pretty common in most Spanish towns.So take you pick and shovel along. I could go on with a few more but I am going to finish with a plug for this interesting and fun medieval and out there on the edge(of a cliff) city. It is a charming and intriguing place but you have to work at it when visiting otherwise you just get the sitting in the main square,visit the cathedral vision of the city.If you explore the nooks and crannies you’ll find fun and unique places.But importantly,its second most enchanting facet is that it is on the edge of one of Spain’s classic wild and wonderful sierras where you can get lost in the mountains and see loads of wildlife,the source of the Cuervo River and the Jucar River, Las Torcas(huge natural craters), La Ciudad Encantada and Las Majadas(both strange clusters of weather eroded rocks in all kinds of shapes in a beautiful natural setting).And, if you have time visit the restaurant in Las Majadas village called Las Majadas….the owner is one of these unique people who tells you what you want for lunch by looking at your face…he really is a one-off character and the food is excellent local fayre. 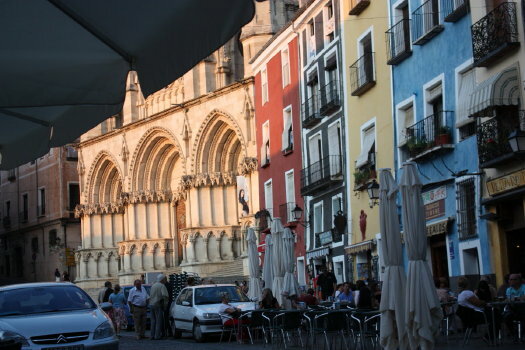 This entry was posted in Spain and tagged ave, Craft Beer, Cuenca, Food, food and wine holidays, hanging houses, holidays, medieval streets, owls, the Inquisition, tourism by Paddy Waller. Bookmark the permalink. 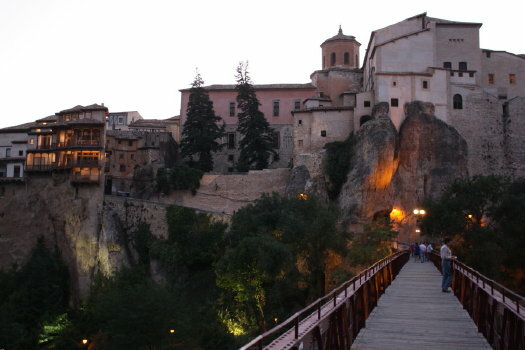 Cuenca is still high on our list of places to visit. Beautifully painted – it’s one of the few parts of Spain I’ve not visited, though I’ve always been drawn to it. The closest I’ve ever gotten is Uclés! Thanks for commenting Cat…you’d like Cuenca. 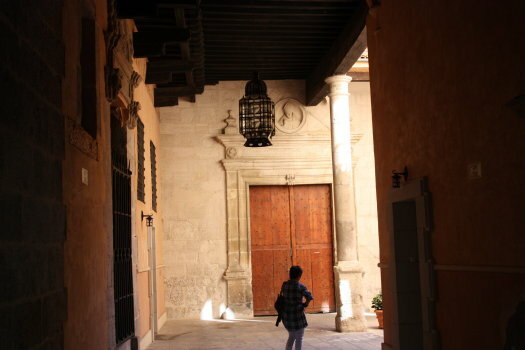 You got close then.We aldo stopped off at el Monasterio de Uclés….strange place with a dark history..the guy in teh shop there was a character..free tasting of wine,cheese,patés etc Great aperitivo just before our lunch!! Cuenca made it onto my radar when I read Winter In Madrid, but I still haven’t been. Will make sure to try the intestines (and the local brew) whenever I make it there. Japanese tourists really love Spain. I run into them often during my trips here. I guess I will be one of those day trippers visiting Cuenca from Madrid soon. 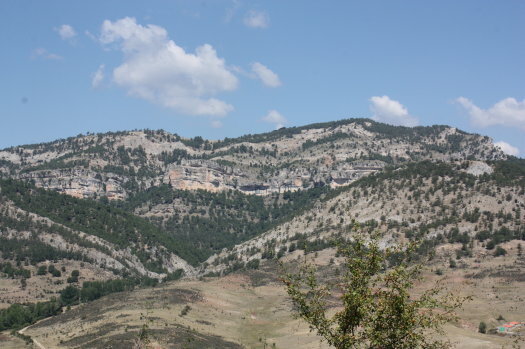 Right now I am heading into Cazorla for a few days starting tomorrow. Too bad I have not planned a visit to Valencia or we would be sitting down to have a cold one. Very True Eduardo…..Yep I met loads on El Camino as well.Wow Cazorla..one of our favourite parts of Spain….it is the biggest protected space in Spain and easy to find peace and solitude.Highly recommend a drink on the Parador terrace,the Rio Borosa walk right up past the water tunnel up to the lakes and if you like birds El Chorro.Enjoy! I’m a Spanish man from Xàtiva (València). I’m interested in knowing English people in order to practice Spanish and English languages. We could meet in a café, speaking half the time in each language. Here you have my email address and also my website, in which I write micro-stories with photographs made by my brother. Thanks for dropping by Vicent. I have sent you a an email!